POSTED November 30, 2017 11:23 a.m. There was good news for Fennimore School District last week with the release of the Wisconsin Department of Public Instruction’s school report cards for the 2016-2017 school year. Fennimore found itself on the upper end of meeting expectations with a score of 71.5 for the district as a whole. 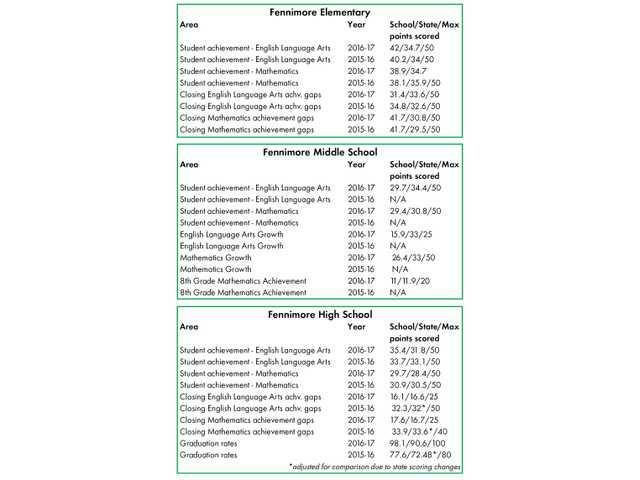 The district, elementary, and high school scores are all improvements over the preceding year. The district received a score of 63.04 for the 2015-2016 school year. The elementary score was 71.9 in 2015-2016, and the high school score was 70.7. The 2016-2017 middle school fared worst, with a score of 58 – meeting few expectations. For the complete article, please see the Nov. 30, 2017 issue of the Fennimore Times.